"It's a poor choice between the gallows and the plantations. A man will clutch at any straw to save his skin!" 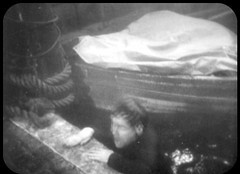 The rope is hauled up but Ben has gone, escaping from his bonds using a trick used by Houdini. 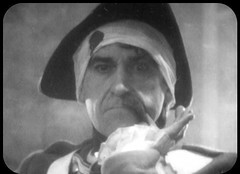 He swims to shore but is caught by a redcoat, who then reveals himself to be the Doctor in disguise. With Polly & Kirsty they row out to the ship, supply the Scots prisoners with weapons allowing them to revolt and take the ship, with Trask going overboard. Grey is taken prisoner and Perkins, tiring of his servitude to him, elects to travel to France with the Scots. The Doctor and party take Grey to the shore, and find Jamie has travelled with them. Grey escapes at the shore but the travellers once more compel Ffinch to help them find where they were captured at which point Polly returns his identity disc and thanks him for his assistance. 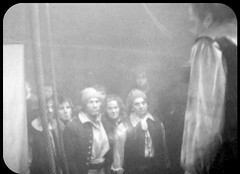 Grey arrives with soldiers, but Ffinch arrests him for his part in the deporting of prisoners to use as slaves. 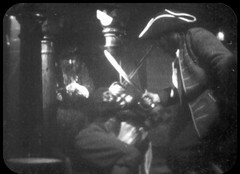 Jamie asks to come with the travellers and the Doctor says yes, on the condition that Jamie teaches him to play the bagpipes. Thankfully we never see that followed up on! Best episode of the four in my opinion, a little bit of action livening things up. Liked this one. 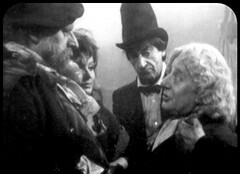 Round 3 of the "I would like a hat like that" gag occurs when the Doctor rescues Ben at the start of the episode, and it's another Tam OP Shanter again this time. Remember we said that this story filmed on location at Frensham Ponds, in Surrey for three days on the 14th, 15th & 21st November 1966? The final date a week later than the first two was necessary because the ending of the episode had been changed: originally Jamie was meant to remain behind and all indications are the Tardis departure was filmed with just the Doctor, Ben and Polly. 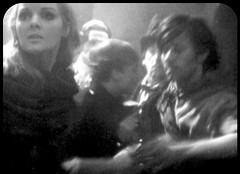 But after this the production team decided Jamie should join the Tardis crew, bringing them back up to the original four, and so they returned to the location for a reshoot. Gerry Davis, the show's script editor who did a large portion of the work writing this story for television, novelised the Highlanders for Target books in 1984. It was released on CD in October 1999. It was later released on CD as part of the Adventures In History boxset and will be re-released as part of Doctor Who: the Lost TV Episodes Collection 3. The Highlanders had long been rumoured to be the planned second release in the series of MP3cd reconstructed releases that started with Power of the Daleks, but it never materialised.